This subspecies of the western gorilla is unfortunately known for being the most threatened of all subspecies. It was initially considered a new species in 1904 when it was named Gorilla diehli, but its lifestyle was unknown for many years until further research made in the 1980s produced new interesting facts about its life. Despite being considered as a species before, new information led to consider them as a subspecies of the western gorilla. The appearance of the Cross River gorillas is not very different from the other subspecies. At first glance, their body is robust and powerful, with a slightly elongated head and a pronounced brow ridge. However, their skull is slightly shorter than the western lowland gorilla (Gorilla gorilla gorilla), and their mouth is not as big as that subspecies. They have teeth, hands, and feet apparently shorter than the western lowland gorilla, a broad nose with wide nasal passages, opposable thumbs, and fingers. Their skeleton is sturdy, with straighter vertebrae than that of humans. There is sexual dimorphism: males are taller and heavier than females. On average, they are 1.65 to 1.75 meters height and weigh between 140 and 200 kilograms. Females reach an average height of 1.40 meters and a weight of about 100 kg. Both genders have a dark fur over the whole body except the face, ears, hands and feet. Is the most threatened of all subspecies. This subspecies is the world’s strangest gorilla; rarely seen and with a small population. It lives in a region between Nigeria and Cameroon, just at the Cross River basin. It is, therefore, the subspecies that inhabits the most north and west regions of all. There are populations in the Afi Mountains in Nigeria, the Mbe Mountains in Cameroon, in the Takamanda National Park in Cameroon, and in the Cross River National Park in Nigeria. They inhabit mountainous rain forests and bamboo forests at altitudes of 1,500 to 3,500 meters above the sea level. This subspecies was recorded for the first time on video in 2009. 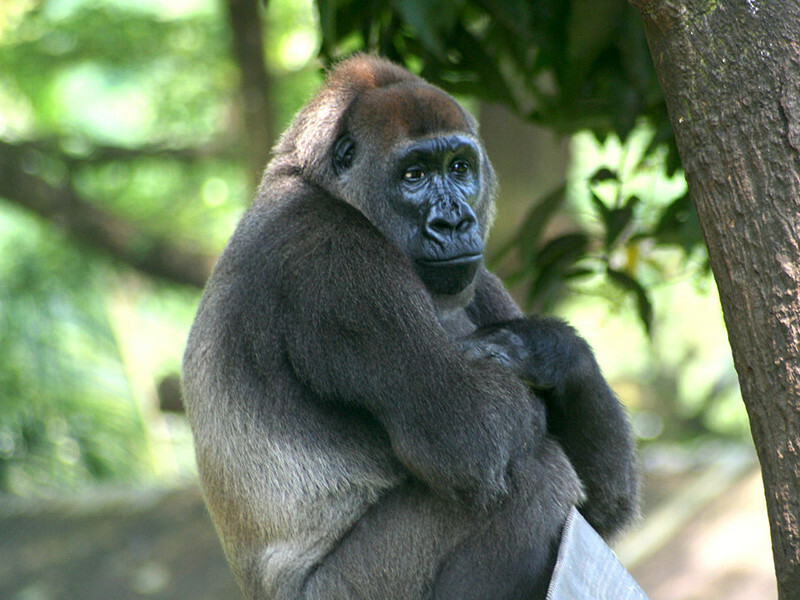 The Cross River gorilla is a shy animal, which avoids areas populated by humans. Besides, they need to live in areas with abundant vegetation to survive. Like all other subspecies, the Cross River gorilla (Gorilla gorilla diehli) has a herbivorous diet that includes leaves, fruits, herbs, vines and tree bark. They like fruits very much, but these are only available in the seasons ranging from August to September and November to January. During the times of fruit shortage, the consumption of bark and vines increases. They have long intestines to digest plants, and this is why they have large and rounded abdomen, even bigger than their chest. In general, it is known that other subspecies of gorillas can occasionally add to their diet small insects like termites and caterpillars although there is no evidence that this subspecies does it. One confirmed fact is that the Afi Mountain gorillas prefer the plants of the genus Aframomum during particular seasons. These large animals are social and live in flexible family groups with 2 to 20 individual approximately. Initial conclusions suggest that this subspecies has similar social behavior than other gorillas, with groups led by a “silverback” male, which protects females and their offspring and takes important decisions, such as the group feeding and resting sites. The dominant male and 6 or 7 females with their offspring compose family groups of Cross River gorillas. They build nests of branches and leaves on trees or on the ground, where they rest and sleep, in the company of the few individuals of the troop. During the rainy season they build their nests atop a tree to protect themselves from the water, but during the dry season they usually make the nests on the ground, this can be confirmed at least in the case of gorillas under research. They spend most of the day eating to maintain their size and strength, but they also engage in some recreational and social activities such as grooming. In Cameroon, they have been observed using rudimentary tools. Although the other subspecies are mainly peaceful, the Cross River gorilla are aggressive against humans, launching branches, herbs and stones sometimes. Estimations suggest that there are probably less than 200 mature gorillas. The Cross River gorilla (Gorilla gorilla diehli) is a polygamous animal since the dominant male has the privilege of mating with all sexually mature females in his group. There is very few information about their reproduction, although most experts agree that the gestation period is similar to the other gorillas between 8.5 – 9 months and females breastfeed and take care of their young during their initial years of their life. Usually, a single infant is born, and twins are rare. According to the red list of the International Union for Conservation of Nature, the Cross River gorilla is critically endangered (CR) and it has been this way for several years. The number of individuals left in the wild is unknown, but estimations suggest that there are probably less than 200 mature gorillas, perhaps less than 50 in each subpopulation. They inhabit places close to some cities and towns that tend to grow. Additionally, logging to convert forest into agriculture and grazing land, reduce their natural habitat. Their hunting is illegal but still practiced because the omission to enforce the law to the full extent by the lack of resources or corruption practices. The small number of gorillas available for mating reduces the options, which ultimately affect their health and chances of survival. Some organizations propose to contribute to their conservation through awareness and education, but probably that won’t be enough. Some others are looking to define protected forest areas where they can freely move.